Lockheed Martin envisions its Jupiter spacecraft and Exoliner container as first serving as an unmanned cargo delivery ship to the International Space Station. Lockheed Martin has unveiled a new spaceflight architecture that it says could take cargo to the International Space Station and help facilitate humanity's spread out into the solar system. Lockheed hopes the system — which features a space tug known as Jupiter and a supply module called Exoliner — wins a NASA contract for the next round of cargo missions to the space station, which would commence in 2018. But the company's ambitions extend far beyond low-Earth orbit, to destinations such as the moon and Mars. Lockheed unveiled the project, along with a video animation of how Jupiter and Exoliner would work, on Thursday (March 12). "That means that NASA will be able to start doing some early human spaceflights beyond low-Earth orbit without a huge investment," Hopkins added. "Instead, what they'll be able to do is buy more copies of the same design." Lockheed named the refuelable Jupiter spacecraft after one of the two locomotives that met at Promontory Summit, Utah, in 1869 to mark the completion of the First Transcontinental Railroad. The "public-private partnership that basically established the Transcontintal Railroad changed everything," said Jim Crocker, vice president and general manager of Lockheed's Space Systems International division. "It changed the economics of how the United States competed in the world, and we believe that the system that we're unveiling tonight will do the same." 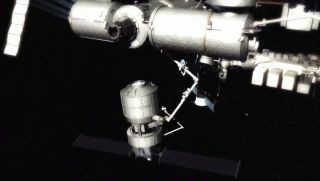 Two American companies — Orbital ATK and SpaceX — currently resupply the space station for NASA under separate billion-dollar contracts. Last year, the space agency solicited proposals for a new round of private cargo delivery, called Commercial Resupply Services 2 (CRS-2). If Lockheed Martin's entry is selected, the company's first operational mission — likely in 2018 — would launch Jupiter and an Exoliner toward the orbiting lab aboard a United Launch Alliance Atlas V rocket. The Exoliner will be able to haul up a maximum of 11,000 lbs. (5,000 kilograms) of pressurized cargo and 3,300 lbs. (1,500 kg) of unpressurized cargo, Lockheed representatives said. The vessel is designed to be disposable, like the cargo ship it derives from, the European Space Agency's Automated Transfer Vehicle. (The new vehicle will be built by European company Thales Alenia Space.) So after unloading the Exoliner, astronauts on the station would fill the vessel with trash and send it to burn up in Earth's atmosphere. The Centaur would then de-orbit, taking the used Exoliner to a fiery death, and Jupiter would haul the new cargo vessel to the space station. This cycle would repeat on future resupply missions, which would launch just the "brainless" supply modules. "The expensive part of this system stays in orbit and is reused on every mission," Crocker said, referring to Jupiter. This artist's illustration shows how a Jupiter spacecraft and Exoliner container could fly with NASA's manned Orion capsule on a mission to the moon. Lockeed Martin Space Systems is developing the Jupiter/Exoliner spacecraft as a utility ship for orbital and deep space flights. Lockheed hopes International Space Station resupply missions are just the beginning for Jupiter and the Exoliner. Jupiter is based on NASA's Lockheed-built Mars Atmosphere and Volatile Evolution spacecraft, or MAVEN, which arrived in orbit around the Red Planet in September 2014. Jupiter is therefore designed for deep-space travel, Hopkins said. And the Exoliner could be modified easily to become a human habitat rather than a cargo vessel, he added. Indeed, Hopkins said the system could be used to establish a human outpost near the moon, which would help our species learn how to live in deep space and prepare for more ambitious treks to an asteroid or Mars. The Jupiter/Exoliner system could be used in concert with NASA's Orion capsule, which the agency is developing to help get astronauts to deep-space destinations. Attaching Exoliner to Orion would triple astronauts' living space, Hopkins said. The Exoliner could launch atop NASA's Space Launch System megarocket, or on existing or planned commercial heavy-lift vehicles, Lockheed representatives said. "We want the ability to offer commercial logistics services to NASA and the international partners, not just to ISS but to lunar orbit and beyond. So this gives us the capability to exercise that business model," Hopkins said. "With our CRS-2 offer, we're not just developing the technology to provide this first cis-lunar [Earth-moon space] outpost, we're also demonstrating the economic model to make that work in an affordable way."